Last week when I was visiting my Dad, he started talking about the fact that he "wouldn't be around much longer." "Hey," I said, attempting some gallows humor. "I've seen a lot of people die in the last few years, and you're not there yet." Sadly enough, I have watched a lot of people die in my lifetime, and especially in the last three years - perhaps not a lot by medical standards, but it seems like a lot for a normal middle aged woman. I've come to recognize the signs of death all too clearly, the pattern of symptoms that occurs (at least in the elderly) when their bodies stop working bit by bit, the organism shutting down in stages until every last function ceases. Death is on my mind more than it should be these days and I have to admit that it's "bumming me out," as the kids might say. Yesterday was the sixth anniversary date of a young friend's death. Monday was my late uncle's birthday. Fresh reminders of losses that still pang my heart. My neighbor died yesterday - when I went to see her Monday, she had already slipped into that stage the hospice people call "actively dying." Nevertheless, I talked to her for a bit, because many people who work with the dying believe that they do hear what's being said to them, even when they're halfway over that final precipice. So I told her about my grandson (whose birth pleased her so much because she's known my son since he was a toddler), and told her what Magic and Molly had been up to. When I left, I touched her hand and said, "Goodbye dear lady and good, good neighbor." 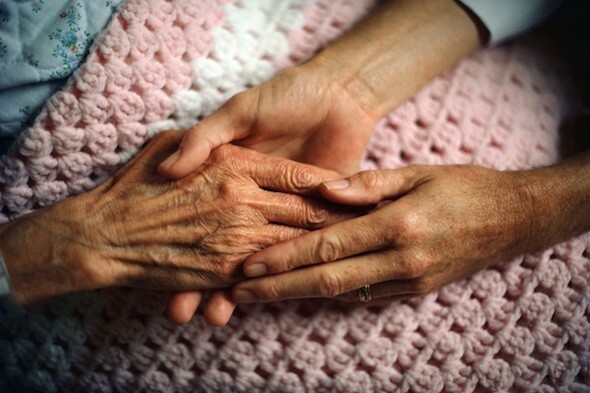 In an article I read the other day, hospice chaplain Kelly Eagan wrote about her experiences talking to the dying. People who are dying want to talk mostly about their families, Eagan says. They talk about the love they received (or didn't) and the love they gave in return (or failed to give). They sometimes reach out blindly at the very end and call out - Mama, Daddy. Eagan doesn't find this at all strange, despite the protestations of her divinity professor who scorned her for failing to use this time to help people define and express their faith in God. Eagan believes that people talk to her about their families because "that is how we talk about God. That is how we talk about the big spiritual questions of human existence." "We don't live our lives in our heads, in theology and theories," Eagan goes on to say. "We live our lives in our families: the families we are born into, the families we create, the families we make through the people we choose as friends. This is where we create our lives, where we find meaning, where our purpose becomes clear." That makes perfect sense to me, as I sit here dwelling (perhaps a bit too much) on the people I've lost among my family and friends, and it fits with my experiences of their last days. They all spoke wistfully of parents long gone, remembered happy times with spouses and siblings and friends, talked of children and grandchildren with poignant pride. It is in the midst of our relationships that God shows His face, where He lives and moves and has His being. Without those people, life is so much less -it's like stripping the world of color and warmth, like being trapped in an airless room. If I've learned anything from all these deaths, I've learned that the most important things in life are not, of course, things at all. What is important are people and relationships. The faces around your bed in your last days. The voice whispering a heartfelt goodbye.